This is a very basic but detailed history describing the conception, planning, construction, architecture, scope and operations of New York City’s famed Pennsylvania Station, from its beginnings as a mere idea in 1897 through the time of its initial opening for trains of the Long Island Rail Road in September 1910. Included in the 74-page Special Issue are 5 railway maps and diagrams of Greater New York, interior plans of Penn Station at its opening and three timetables depicting the railway facilities of that era in an ETT format. Obtainable in electronic form (.pdf) through annual membership in: The New England Chapter, Pennsylvania Railroad Technical & Historical Society PO Box 624, Marlborough, Massachusetts 01752-0624 2015 Dues are $15, and includes subscription to the chapter’s regular quarterly electronic (.PDF) publication: “The East Wind,” plus additional Special Editions as they are published. 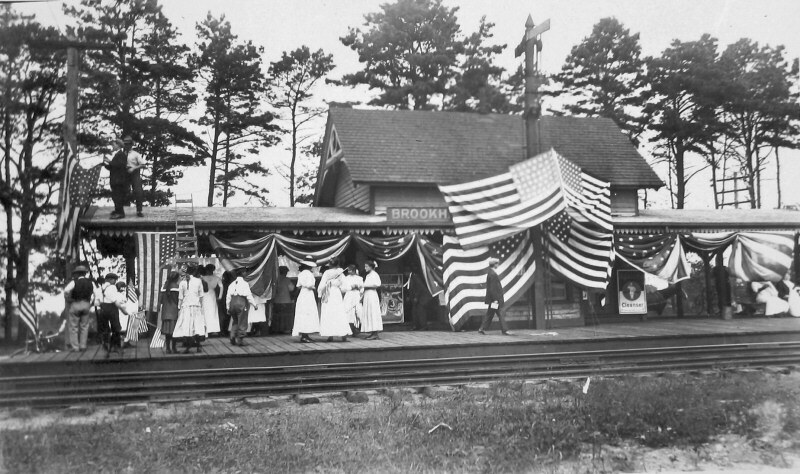 Read PART 5: PENN STATION OPENS AND A SUBURBAN COLOSSUS EMERGES by George Chiasson, Jr.
As the LIRR system’s shape matured in the late nineteenth century, the railroad could no longer count on expansion to increase ridership. To increase traffic, the LIRR began a new promotional campaign: commutation. 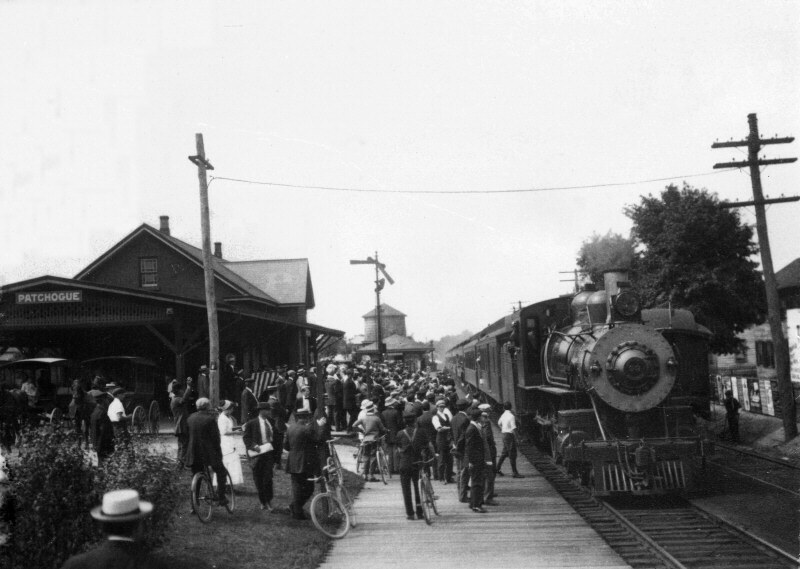 It published “booklets setting forth the advantages of every little town.” The railroad recognized that commutation had enormous revenue potential. If it could convince a critical mass of people to become suburban commuters, the LIRR would see a sizeable increase in the number of daily riders. Thus, beginning in the 1870s, the LIRR Passenger Department tried to convince potential Long Island homeowners that daily commutation to New York City was manageable. 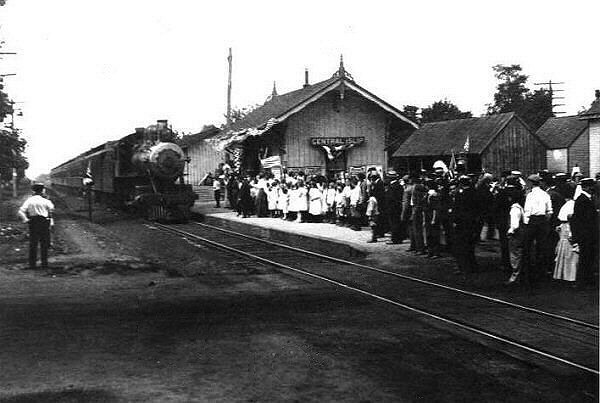 The railroad’s effort to promote commutation met with moderate success between 1880 and 1910. 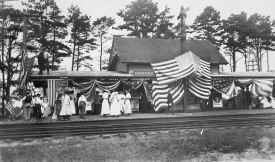 During the 1880s, the LIRR ran fifteen trains daily along the main line and twelve along the South Shore Division -and a few commuter towns were emerging along the railroad routes. 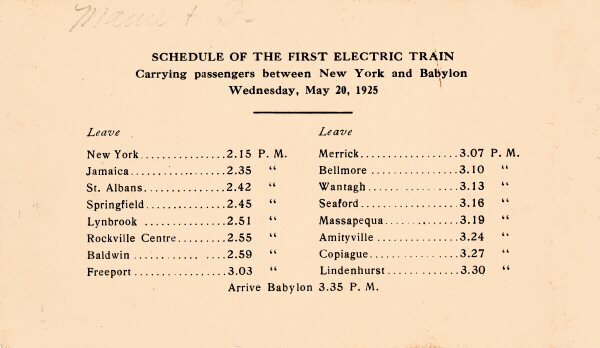 During the 1890s, the number of Long Island commuters increased substantially: the Main Line, South Shore Division, and Oyster Bay Branch of the LIRR all saw 50 percent increases in the number of daily commuter trains. 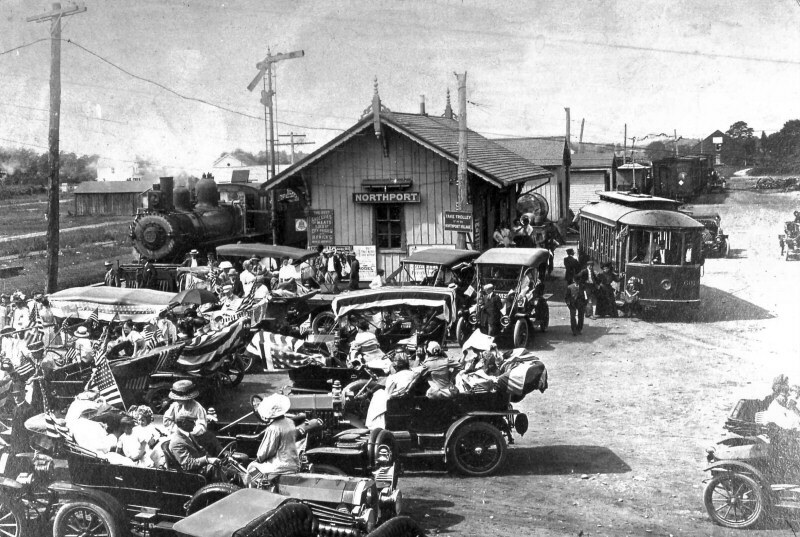 Despite this growth, the number of commuters was limited by one glaring inconvenience: the railroad did not actually run all the way to Manhattan. The islands of Manhattan and Long Island were separated by the East River, and until 1899, no tracks ran across the East River. Prior to 1899, all passengers heading to New York City had to take the LIRR to a terminal at Long Island City. From there, they would board ferries that would carry them across the East River to terminals at 34th Street, East 7th Street, and James Slip (the intersection of Front Street and South Street). According to railroad historian Ron Ziel, the railroad maintained a large fleet of ferries, tugboats, and steamboats to transport passengers and freight across the river. For passengers, the transfer at Long Island City was time consuming and unpleasant. Furthermore, all passengers heading to New York City had to disembark and board ferries at a single terminal. The result was a serious bottleneck, which delayed passengers waiting to board ferries. While the LIRR ferried passengers across the East River to Manhattan, the Pennsylvania Railroad ferried passengers from the West across the Hudson River to Manhattan. 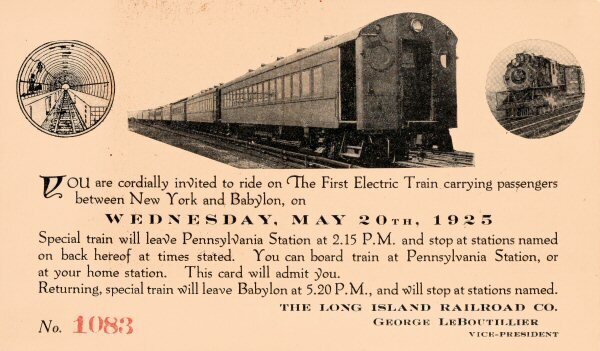 For reasons analogous to those recognized by LIRR President William Baldwin, the Pennsylvania Railroad (PRR) was making plans to build an all rail route to reach Manhattan from the West. Unlike the LIRR, the PRR was one of the nation’s largest railroad syndicates and consequently had the financial resources to launch such a large undertaking. However, permission to build rail lines and a terminal in the borough of Manhattan had been granted to the LIRR, not the PRR. 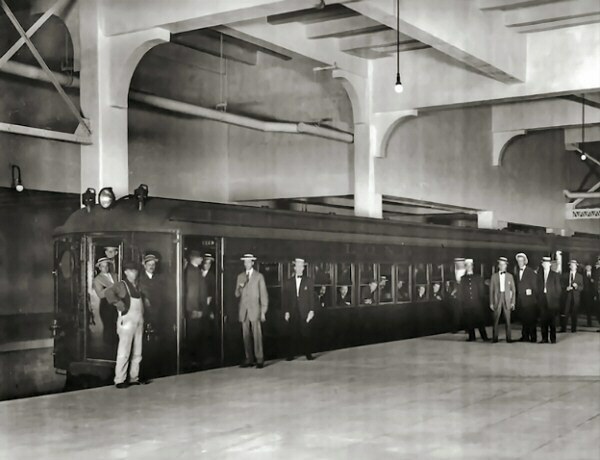 In 1900, LIRR President William Baldwin and the PRR finalized an agreement by which the Pennsylvania Railroad would purchase the LIRR for $6 million provided that it would build a terminal in Manhattan and railroad tunnels under the East River. Under this arrangement, both railroads (which remained operationally distinct until 1928) would be able to operate direct rail service to Manhattan. Pennsylvania Station and the East River tunnel project would take ten years to complete at a cost of $125 million. 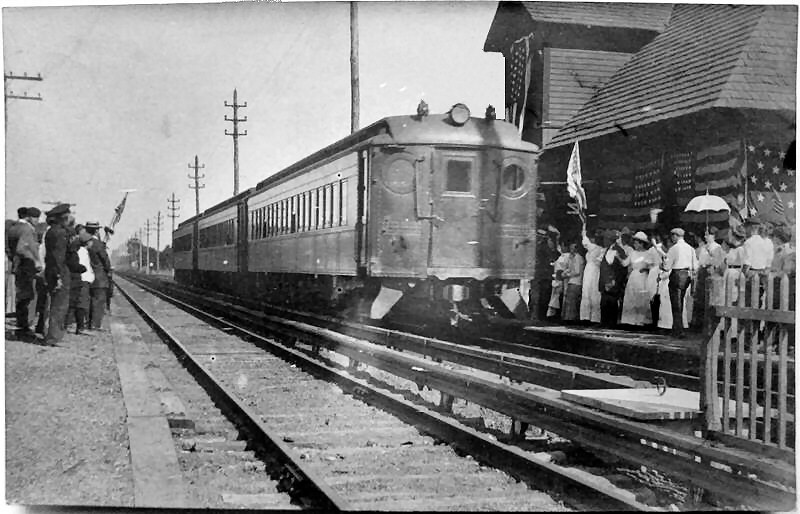 Although some individuals and op-ed writers lamented that “the Long Island Railroad has been unique in that it has been exclusively a local road . . . now all this is to be changed,” their lament did not override the need for adequate service to Manhattan. LIRR service was vastly improved; the number of commuters soared after the station and tunnels opened in September 1910. The construction of Pennsylvania Station and the East River tunnels eliminated the major inconveniences that had plagued the LIRR’s service to Manhattan and made commutation possible on a wide scale. 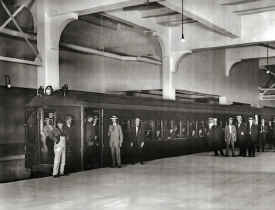 Prior to the completion of the tunnels, the number of people willing to undertake the daily journey to Manhattan was limited by both the railroad’s capacity and passenger inconvenience. The new infrastructure gave the LIRR the capacity to transport hundreds of thousands of people to and from New York City each day. With an efficient direct line to Pennsylvania Station, the LIRR delivered thousands of passengers per hour into the very heart of New York City. The expectations of Pennsylvania Station’s planners were met and exceeded in the two decades after its opening in 1910. The new residents were commuters. 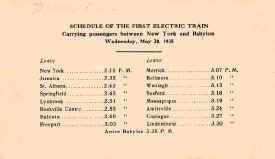 Brooklyn was the first major commuter terminal, not Long Island City. We forget that Brooklyn was itself a major destination with a large LI-oriented business and legal community. Downtown Manhattan passengers transferred to Brooklyn Bridge trains or the Fulton Ferry (and later the subway) to get to Manhattan as well – cheaper, faster and more convenient than going to NYP and doubling back downtown. Of course the cheaper went away when the MTA made Flatbush Avenue the same fare zone as NYP, and more riders drifted to NYP because of better service and the steady decimation of Brooklyn trains as a result. I’ve seen figures in Regional Plan publications that indicate the majority of commuters – people using weekly or monthly tickets – used Flatbush Avenue until shortly after WW II. One ways, ten trips etc. were the vast majority at LI City, and later Penn Station. 1st LIRR train filled with special invitees (press, dignitaries, officials) about to leave the newly-opened Pennsylvania Station for points east on Long Island on September 8, 1910.